1.1 This Party Rental Agreement and alterations issued after execution of this agreement. This contract represents the entire and integrated agreement between the parties hereto and supersedes prior negotiations, representations of agreements, either written or oral. A 30% deposit is payable at the time of the reservation. Payment is due, in full 24 hours before the commencement time of rental. Renter agrees to pay all collection fees and charges including but not limited to all legal and attorney fees that result should Renter default in payment of this contract. Overdue accounts are subject to interest charges from the date payment is due at 18% per annum. Renter authorize Amanzi Party Rentals to charge the following credit card with any and all fees for this rental equipment as per this Party Rental Agreement. NOTE: Driver pick-up time is approximate. Driver may arrive as early as 7:00 a.m. on date of rental per Party Rental Agreement or as late as 11 pm to pick up the equipment. Renter is responsible for, andrequired to stay with all the equipment until it is picked up by our representative, or other arrangements have been made. Safety/Operating Instructions: In addition to the information set forth in this agreement, the Renteracknowledges that there are safety and operating instructions on the equipment delivered and agrees to read those instructions and operate the equipment, or allow the equipment to be operated or used, in accordance with those instructions. Renter further acknowledges and understands that Amanzi Party Rentals has not agreed to nor have they provided any operators with this rented equipment, and that Renter, is solely responsible for the correct and safe operation of this equipment. Renter understands that children's safety depends upon Renter providing AT ALL TIMES correct operation of and the use of the equipment. Renter further agrees to keep all equipment away from swimming pool(s) and Renter understands and agrees that they will not operate any electrical equipment near water. By entering into this agreement, Renter acknowledges that there is a risk of injury or damage arising out of the use of this equipment. Renter voluntarily agrees to keep and maintain all safety rules for the correct, safe operation and installation and use of all equipment, and to assume any and all risk of injury or damage. In particular, Renter will not permit the equipment to be operated by anyone who is not fully qualified and who has not received instruction from Renter on the safe operation and use of the equipment, nor shall Renter allow any person to use or operate the Equipment when it is in need of repair or when it is in an unsafe condition or situation. General Release/indemnity/hold harmless: I understand and acknowledge that play on an amusement device entails both known and unknown risks including, but not limited to, physical injury from falling, slipping, crashing or colliding, emotional injury, paralysis, distress, damage or death to any participant. I hereby voluntarily and expressly release, indemnify, forever discharge and hold harmless Amanzi Party Rentals from any and all liability, claims, demands, causes or rights of action whether personal to me or to a third party, which are in any way connected with participation in this activity, including thoseallegedly attributable to negligent acts or omissions. Should Amanzi Party Rentals or anyone acting on behalf of Amanzi Party Rentals be required to incur attorney's fees and costs to enforce this agreement, I expressly agree to indemnify and hold Amanzi Party Rentals harmless for all such fees and costs. 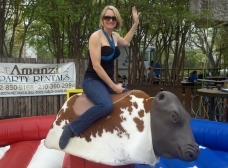 In the event I, the undersigned, or any of my participants file a lawsuit against Amanzi Party Rentals, it is agreed to do so solely in the State of Texas. I agree that if any portion of this agreement is found to be void or unenforceable, the remaining portions shall remain in full force and effect. In consideration of being permitted by Amanzi Party Rentals to use its equipment and facilities, the undersigned and it participants agree to indemnify and hold harmless Amanzi Party Rentals from any and all claims which are brought by the undersigned and/or their participants and which are in any way connected with such use or participation. 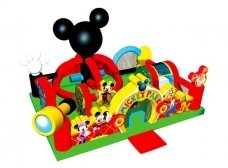 A set of Rules and Direction are either displayed on the bounce house/unit(s) or have been provided to the undersigned which I agree to follow and utilize at all times during operation and use of the unit(s). Identity of parties: For the purposes of this Rental Agreement. "Amanzi Party Rentals" shall mean Amanzi Party Rentals, itsowners, officers, directors, shareholders, employees, contractors, agents and "Renter" shall mean the person(s) or company listed in Item 1 of the Party Rental Agreement, as well as the person signing the agreement (if different), and their agents and/or employees. Equipment, Rent, Payment, and Term of Rental Agreement: Renter rents from Amanzi Party Rentals certain equipment described on the Party Rental Agreement. The rental fee set forth is payable, in full, 24 hours in advance, and the rental term shall be that listed as per item 3.1 and 3.2 in this Party Rental Agreement: but all of Renter's obligations arising under the terms and conditions of this Party Rental Agreement shall run from actual delivery of the Rental Equipment to the actual pick up of the Rental Equipment byAmanzi Party Rentals. If the Equipment is delivered by Amanzi Party Rentals then Renter shall not be entitled to any refund whatsoever if Renter elects not to use the Equipment due to weather or other causes. Returned Check policy: In the event that a check is returned to Amanzi Party Rentals for insufficient funds Renter agrees to pay the total rental price as well as an additional $30.00 fee to Amanzi Party Rentals in cash immediately upon notice. Weather: Amanzi Party Rentals cannot guarantee weather conditions, we reserve the right to cancel or reschedule your rental prior to delivery if severe weather conditions are imminent or if we have any reason to believe that the inflatable equipment and/or its users may be in danger. Some examples of severe weather are high winds, excessive rain, snow, and lightening. In the event of severe weather during a rental, Renter agrees that he /she/they will unplug the inflatable, allow it to deflate, and not use the inflatable until the severe weather ends. Delivery: Amanzi Party Rentals shall deliver the Rental Equipment to address in the Party Rental Agreement specified by Renter. Renter grants to Amanzi Party Rentals true right to enter the property for delivery, and required set up, if any, and for subsequent pick up of the Rental Equipment and any associated equipment or packing materials at the approximately specified times. Renter is fully responsable for locating and paining location all utility lines including but not limited electrical lines, water lines, gas lines, irrigations lines BEFORE day of delivery. In case renter does not paint any location lines, renter take all responsability to ANY and all damage to any of these lines caused by staking down the equipment. Receipt/inspection of Rental Equipment: Renter hires the Rental Equipment on an "as is" basis. Renter acknowledges that Renter has inspected the installation of the rental equipment and will personally inspect the rental items prior to its use, and will read the operating/safety instructions prior to use. Renter specifically agrees that such rental items will not be used if Renter finds that it is not suitable for Renter's needs. Renter acknowledges receipt of all items listed in this Rental Agreement, and that they are in good working order. Possession/Title: Renters right to possession of the Rental Equipment begins upon the items being delivered to Renter's premises and terminates on the actual pick up by Amanzi Party Rentals. Retention of possession, or any failure to permit the pick up of the item(s) at or after the end of the "Rental Period" specified constitutes a material breach of this Agreement. 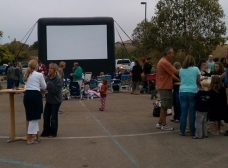 In the event that the Equipment is not returned for any reason, including theft, the Renter is obligated to pay to Amanzi Party Rentals the full replacement value for such Equipment listed, plus any and all incidental costs associated with the attempted pick up or recovery of the Equipment by Amanzi Party Rentals. Title to the rental items is and shall remain in Amanzi Party Rentals. Renter agrees to keep the Rental Equipment in his/her/their custody and control from the time of Amanzi Party Rentals's delivery of the items, until Amanzi Party Rentals picks up such items. Renter shall not cause nor permit these items, or any of them, to be sublet, rented, sold, or removed from the Delivery Address, or otherwise transfer such items. If rental items are not returned and/or levied upon for any reason whatsoever, Amanzi Party Rentals may retake possession of said items without further notice or legal process and use whatever force is reasonably necessary to do so. Renter hereby agrees to indemnify, defend, and hold Amanzi Party Rentals harmless from any and all claims and costs arising from such retaking and/or levy. If rental items are levied upon, or otherwise moved from Delivery Address, Renter shall notify Amanzi Party Rentals immediately. Care of the Rental Equipment: Renter shall be responsible for any and all damage to any of the Rental Equipment not caused by ordinary wear and tear. "Ordinary wear and tear" shall mean only the normal deterioration of the rental equipment caused by ordinary, reasonable and proper use of the rental equipment. Renter shall be liable to Amanzi Party Rentals for any and all damage which is not "ordinary wear and tear" in an amount equal to the replacement value of the rental equipment on this Agreement. Damage which is not "ordinary wear and tear" includes, but is not limited to, cutting or tearing of vinyl or netting, damage due to overturning, overloading, exceeding rated capacities, breakage, improper use, abuse, lack of cleaning, contamination of or dirtying of rental equipment with non-approved items such as chemicals, non approved food, paint. silly string (see Paragraph 11), mud, clay, or other materials. Equipment Problems: Should any equipment develop a problem, or does not function correctly at any time or Renter does not understand the operating Instructions. Renter agrees to immediately cease use of that equipment. In particular, if the inflatable unit begins to deflate, Renter will immediately have the riders exit the unit and then check for one of the following conditions: 1) The motor has stopped; in which case check the power cord connection at the outlet where the unit plugs into the house to make sure that it has not been unplugged; 2) If motor continues to run. check for blockage of the air intake screen on the side of the blower unit. Also, check both air tubes on the back of the unit for snugness and tighten the ties if necessary; 3) If either of these steps corrects the problem, fully re inflate the unit prior to permitting anyone to use the unit 4) If you cannot correct the problem, call our office at 512-850-9168. Specific Rules and Instructions for the inflatable equipment: The following rules and warnings must be obeyed in the use of inflatable equipment: A) All safety and operating instructions contained on the inflatable must be complied with and followed at all times; B) For the safety of all CHILDREN, ADULT SUPERVISION IS REQUIRED AT ALL TIMES; C) No silly string Is permitted to come In contact with the inside or outside of the inflatable unit, this causes Irreparable damage to the inflatable, and Renter acknowledges that If the inflatable Is damaged by "Silly String", then a $500.00 fee shall be automatically imposed by Amanzi Party Rentals and shall be Immediately due and payable by Renter D) WARNING - extra caution and supervision are required for children ages three (3) and under. E) WARNING - It is unsafe to stay In inflatable if winds exceed 20 miles per hour (MPH). Have all persons exit inflatable, then unplug the blower unit and let inflatable deflate. F) WARNING - Individuals with head. neck, back or other muscular-skeletal Injuries or disabilities, pregnant women, small infants, and others who may be susceptible to Injury from falls, bumps or bouncing are not permitted in the unit at any time, G) Do not move the inflatable from the location where set-up; H) If the inflatable unit moves, pull comer(s) back to their original location(s) and re secure; For other questions regarding the safe installation of equipment, please call our office at 512-850-9168. I) Do not let the inflatable unit rub up against any surface. Limited Warranty: Amanzi Party Rentals warrants that the Rental Equipment leased under this Agreement will be in good working order when delivered under this Agreement. All equipment is supplied and maintained subject solely to this warranty. Amanzi Party Rentals's sole and exclusive obligations under this warranty is limited to repair or replacement of the rental equipment when Amanzi Party Rentals determines that it does not conform to this warranty. Amanzi Party Rentals makes no warranty of merchantability or fitness for any particular use or purpose, either express or implied. There is no warranty or representation that the rental equipment is fit for Renter's particular intended use. or that it is free of latent defects. Amanzi Party Rentals shall not be responsible to Renter or to any third party for any loss, damage, or injury resulting from, or in any way attributable to the operation of, installation of, use of, or any failure of the rental equipment. Amanzi Party Rentals shall not be responsible for any defect or failure unknown toAmanzi Party Rentals at the time of delivery. Cancellation Policy: Renter will receive a full refund of deposit with cancellation at least 2 weeks prior to reservation date. If Renter cancels less than 2 weeks prior to reservation dateAmanzi Party Rentals will keep the deposit, but Renter may apply it to a future rental within a 30 day period or forfeit the deposit. If Renter cancels within 24 hours of delivery time, the full amount is due to Amanzi Party Rentals as per this Party Rental Agreement and NO REFUND is payable. All Weather Cancellations must be made by 8:00 AM the date of the rental to receive refund of deposit. Compliance with Laws: Renter agrees not to use or allow anyone to use the rental equipment for any illegal purpose or in any illegal manner or in an unsafe manner. Renter agrees at his/her/their sole cost and expense to comply with all municipal, parish, state, federal or other governmental or quasi-governmental laws, ordinances and/or regulations which may apply to the use of the rental equipment during the rental period. Renter further agrees to pay all licenses, fines, fees, permits, or taxes arising from Renter's use of the rental equipment, including any subsequently determined to be due. Renter is solely responsible for obtaining any all permits and/or licenses from the appropriate government agencies prior to use. Renter Acknowledgment: Renter acknowledges and certifies that they have had a sufficient opportunity to read this entire Agreement, and agree to be bound by all the terms and conditions on all pages and that they understand its content and that they execute it freely, intelligently and without duress of any kind. Renter acknowledges the receipt of the Rental Equipment that is the subject of this Rental Agreement and General Release and the fact that it is in good working order. The following rules detail safe operational guidelines for the inflatable equipment you are leasing from Amanzi Party Rentals. 1. Supervision: The safety of the children depends on you. Your personal supervision is absolutely required at all times. 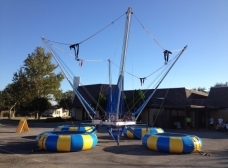 As the lessee of this inflatable unit, the safety of all the riders is your responsability. As the adult superviser (Adult older than 18 years old). you should position yourself in close proximity of the entrance to the ride and be prepared to assist riders when they enter/exit the ride. 3. Shoes/Glasses/Jewelrv: All riders MUST REMOVE SHOES, GLASSES, AND ALL LOOSE JEWELRY before playing in the inflatable. 4. Pre-existing Health Conditions: Pregnant women, individuals with pre-existing injuries, and others susceptible to injury from falls, bumps or bouncing are not permitted in or on the inflatable unit at any time. 5. Flippinq/Wrestling/Pilinq/sliding: Improper use of the inflatable includes flipping in the air, wrestling, and riders piling on themselves. No head first down slides. Such activity may result in neck and back injuries to riders. 6. Installation: Do not remove the inflatable from the area where it was installed. If the inflatable unit moves, pull it by one of its corners back to its original location of installation. Keep the inflatable unit away from swimming pools and other sources of water at all times. 7. Inclement Weather: Once there is a threat of inclement weather, including strong winds (at or in excess of 20 mph), thunderstorms (especially when lightening is present), or severe cold weather (below 40 degrees), children should immediately exit the inflatable. The blower should thereafter be switched off and removed, and the unit allowed to deflate. 8. Deflation: Should the unit begin to deflate, do the following: First, have all children exit the unit immediately. Next, if the motor has stopped, make sure that it has not been unplugged. If the motor is still running, check the air intake on the side of the motor for blockage, and check both blower tubes on the inflatable unit to make sure that they are tightly tied off. Never allow riders in or on a partially inflated unit. 9. 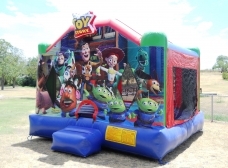 Alterations: No alteration in or attachments to the inflatable unit are allowed, period. 10. General Misuse: Do not allow riders to play or climb on walls, sides or roof of inflatable. Do not allow the inflatable to rub up against any surface. 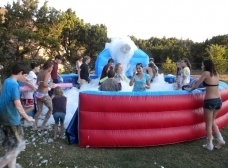 Unless previously authorized by Amanzi Party Rentals, never place a water hose or water in general onto the inflatable. If the moonwalk should become wet, have an adult wipe down unit before riders return. Moonwalk should not be wet when riders enter the unit. This excludes water slides. 11. 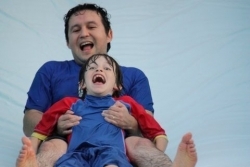 Negligence or Abuse: The following fees may be assessed for negligence or abuse of inflatable. Spilled food, drink or the use of Silly String could result in a $400-$1500 Cleaning Fee. Negligence and damage to unit could result in a $400-$3000 Repair Fee. If unit is not repairable a fee of $2000-$6000 could result. I hereby acknowledge, as witnessed by my signature, that a representative of Amanzi Party Rentals has read the above referenced safety rules cited in this agreement. I further acknowledge by my signature that I understand each of these rules and agree to abide by them completely.